Thanks to advanced awareness of skateboarding and BMX, the amount of public skateparks in the United States has grown tenfold over the last few decades. For many cities, when it comes time to create a place to ride, concrete tends to be the preferred building material due to its long-term endurance compared to wood, metal or plastic ramps. The combination of rapid growth along with major advances in skatepark construction technology has led to the creation of parks that seem more like works of art than something you'd dig your pegs into. With so many more places to ride, one would think that the BMX world would see more products devoted to bowl carves, and technically they're out there, but they're more commonly disguised as parts for trails riders. Although the terrain is vastly different, the end game is still big air and high speed, which works better when your ride is built with more fork offset, mellower headtubes and longer rear ends for added stability. While many "trail oriented" frames and parts work great for park riding, the tires certainly don't, and while slick treads are now incredibly easy to find, there's always room for improvement. For those of us who travel the globe looking to roast the finest concrete waves around, there is only one tire available developed specifically for us, and it has finally arrived: the Animal/Terrible One Ursa Major & Ursa Minor. Although BMX is a huge worldwide community, the BMX industry is a lot smaller than many people think. Joe Rich, owner of Terrible One, was a longtime fan of the tires produced by Ralph Sinisi’s Animal Bikes, but with the frequency of his ramp & bowl sessions increasing, his desire to find a tire that was precisely suited for transition led to conversations about producing a dual branded tire. It took a few years and some staff changes, but the Ursa Major & Ursa Minor are now available, just in time for those golden hour summer sessions. There are a lot of technical features to talk about with these things, but we'll start with the visual appearance: when photos of these tires first leaked a few months back, they didn't look too much different than many of the slick tires that featured recessed tread that are already abundant on the walls of shops everywhere. 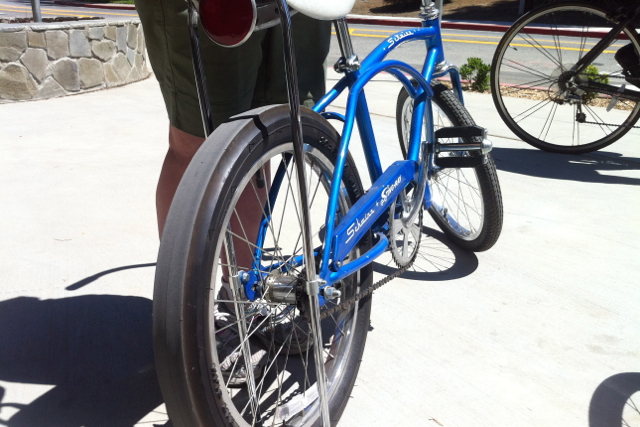 In reality, they more closely resemble a road bike tire crossed with the rear slick from a Schwinn Stingray. Featuring a flat center patch and a specifically curved sidewall designed to keep you planted to the corners at the highest of speeds, the AT1 tire is built to be ridden as fast as humanly possible. While its look is quite unique, its construction is even more notable; the dual compound tread is built to last longer in the center of the tire, while offering extreme grip with a softer compound comprising the sides of the tread that almost feels sticky to the touch. I don't think I'm technically paid to review products as part of KYR, but being that concrete is my preferred riding terrain of choice, it goes without saying that I got my hands on a pair of these as soon as I possibly could, and I don't think I could accurately describe the AT1 tire if I hadn't actually ridden them before starting this column. Joe has written plenty over on the T1 website about why these tires look like they do, but seeing them in the flesh will tell you more than 10,000 words ever could. First, when mounting these things to my bike, the first thing I noticed was that because of the special tire compound, the slick sheen that you'll find on most new tires is basically non-existent. In fact, because they felt like they were already broken in, I skipped my usual parking lot scrubbing and made my way to the bowl right out of the car. After a few pensive test runs, my trust in the Ursa Minors began to grow. Embedded in the sidewall is the suggested PSI level, which starts out at 85psi and tops out at 110psi. I was in such a rush to make it to the park before sundown that I didn't pump much more than 70psi into the tubes, and I can promise you that you need to heed that minimum suggested rating because the combination of low pressure and soft tread led to some struggling to get up to full speed. The next session, I made sure I didn't stop pumping until the needle reached the 100 emoji level and that made a huge difference. Because I was able to carve at my normal rate of speed, it didn't take long to notice how much faster I could carve into corners, which definitely helps boost your confidence level. The gradual curve of the tread keeps more rubber in contact with the ground, and I feel like the "lip" that that design creates also increases stiffness of the sidewall – which, if you're approaching a bowl corner at top speed, the g-forces of the turn can create some sidewall roll in lesser tires; not so much with the AT1. Because the tire seems slightly flatter in the center of the tread, I could feel the coping a little more than usual and that helped in boosting higher out of quarters. It took almost no time at all to feel comfortable riding the AT1’s, and in fact, the only thing that took some slight getting used to was that sidewall lip – when carving high-speed double peg grinds, when you lean over past the edge of that lip, you tend to drop onto the coping slightly harder than a normal tire with a more traditional rounded tread. For bowl riders everywhere, I can't recommend this tire enough. The Animal/Terrible One Ursa Major & Ursa Minor tires are available now at Dans Comp and anywhere Animal or Terrible One goods are sold. If you were confused as to which tire was the bigger one, the Ursa Major is the 2.4" version, while the Ursa Minor is 2.2". Take note that because of the unique shape, the tire sits wider at the sides than your average 20" treads, so make sure you have enough clearance in your rear stays before getting a pair of 2.4"s. The Ursa Majors and Minors weigh in at 30.6oz and 28.2 respectively, and they’ll only run you $29.99 which is a damn bargain for all the speed & confidence you’ll gain. If you need any more inspiration, check out legendary T1 team member Garrett Byrnes making excellent use of this new tires in this new edit.